Once you are logged-in to Your Tune Music Ltd you can start selecting tracks for your personal playlist "My Playlist" (top right link). If you are not yet registered with Your Tune Music Ltd then you can create an account by clicking here. We only need your name, company name and a password. 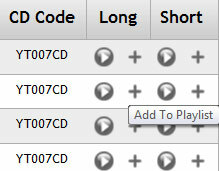 Links to your tracks will then be emailed to your registered email address.